Femminismo a Sud: „a space where people can share their opinion about what‘s going on in our society“. An interview with Fikasicula, the group who founded the Italian anti-sexist, anti-racist and anti-facist blog Femminismo a Sud http://femminismo-a-sud.noblogs.org/. How did your blog Femminismo a Sud came into being? Since when does it exist? What is the idea of your blog? The blog was founded in 2006 and the idea of our blog is to provide information about what's up in the web and the public mainstream, information about feminism, politics and culture. We want to create a space where people can share their opinion about what‘s going on in our society, a space where we can openly say that our society is a sexist, moralist and racist society that shapes our daily life, a space where we can talk openly about our experiences and opinions. Our writing style is very direct because we don‘t want to mystify sexism, racism, homo- and transphobia like the mainstream media does. From our point of view, it is very important to share information and a blog is a media format that all people can read and make use of. One of the first projects of Femminismo a Sud was that we created a manual, like an ABC of technological feminism to give information about how to use the internet to become active as feminist and political activists. Can you describe the current political situation in Italy a bit? From our point of view, our situation in Italy is very tragic because the way of destroying our rights is incredibly strong and effective. There are a lot of actions aimed at criminalizing social groups who fight for political rights and to bash women who don‘t want to get married and become mothers. In Italy there is only one model for women to be a „good woman“ in society. Our government puts a lot of pressure on women to become mothers. This propagated model is not just a stereotype or a cultural idea, rather it‘s a political plan which is not only sexist, but also fascist and racist. In Italy there exists lagers for immigrants who are forced to live there like in a jail. The groups who are most effected by the politics of the Italian government are women, immigrant women and men, and the communities of gay-lesbian-transsexuals-transgenders. With our blog, we want to provide information that the situations of different groups who are strongly effected by neoliberal politics because these situations cannot be seen as separate situations. All these situations are all connected with each other. Do you use also Facebook to disseminate information? Well, we don’t have an official Facebook-Site but there are groups created by people close to us. We find Facebook problematic because we think Facebook is not a network for women. We write in our blog that Facebook is a social network that does not protect the personal data of individuals. Facebook is not a place where we can develop and disseminate our feminist, anti-sexist, anti-racist and anti-fascist politics. Therefore, we don't want to sustain this type of social network. Our blog, like many other feminist blogs, has been attacked by people who want to create a stereotypical opinion about feminism and who persecute women in the web. We call this „cyberstalking“ (squadrismo virtuale). Facebook is a virtual space where cyberstalking can very easily happen. There exists Facebook entries by individuals and groups who persecute us because we are feminist. They produced sexist, racist and masculinist clones of our blogs to give us a bad reputation, to discredit us and our work. This kind of cyberstalking happens a lot in Italy, especially in Facebook. We go for other social networking platforms because they are safer. From our point of view, Facebook is a type of network that is not the right platform for someone who want to talk about social, political or personal problems. For us it is very important to call the blog anti-sexist, anti-racist and anti-fascist because all the people who contribute to Femminsimo a Sud fight for these principles, not only in the web but also in daily life. Sexism, racism and fascism are different aspects of our society which are connected with each other. There is a system of power to control our minds, our bodies and our lives, especially if you want to change the system. Our blog is called Femminismo a Sud because the whole blog has a postcolonial perspective towards society, culture and politics. We locate ourselves in the south of the hegemonic bio-territoriality. We cannot understand sexism without understanding racism and fascism because patriarchy works on very different levels to establish and maintain power. A postcolonial perspective is very useful to understand all the intersections. But Femminismo a Sud and the group Fikasicula is influenced by different types of feminism, including third wave feminism. 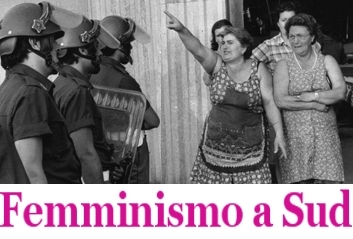 We don‘t want to have only one specific feminist viewpoint that is published at Femminismo a Sud, rather we are interested in many different ideas of feminism and we want to let our readers know about all these different feminist perspectives. Our project is always under construction. It's where new ideas, new theories and emancipatory ideologies can help to create a discussion and argument to fight for better living conditions, for rights and for a change in society. Is your blog Femminismo a Sud embedded in the broader Italian feminist movement? Our analysis of how information is controlled and restricted and our investigations for social and political change are important to create a platform for reflections for feminist and other social movements. These reflections are important to take steps in the right direction to share information about collective initiatives who fight for change in different contexts in Italy, in Europe and worldwide. The people who contribute to Femminismo a Sud live in different cities in Italy. We are all involved in different feminist and anti-racist movements and direct political action. We fight for public spaces where we can talk about what‘s going on in society because we are not represented and we cannot present ourselves and our political ideas in the mainstream media and official institutions. We need to exchange our ideas and analysis because the media is full of sexist and racist content. There are a lot of problems in society and we cannot be silent or even agree to this situation. How many people are involved in the group Fikasicula? When we started the blog in 2006, three persons were involved, by now we are many more. Women and men are involved in the group because we think it‘s important to collaborate with men who refuse the patriarchal way of being a man and who refuse the masculist right-wing movement of men who fight for men‘s rights. We work together with men, not because we think that a man‘s voice is more important than a woman‘s voice; rather we think it‘s also for men very important to reflect on hegemonic masculinity and the various privileges of men. The group Fikasicula is a mixed collective of people with different political and personal histories. We are a diverse group who tries to disseminate anti-sexist, anti-fascist and anti-racist political content. Can you describe the content of Femminismo a Sud? We report and analyse about what‘s going on, mainly in Italy, but we also have reports about the different situations in Europe. We write about how the current neoliberal politics effect the lives of women and restricts the freedom of people. We talk a lot about domestic violence because this is a very serious problem in Italy. Within Femminismo a Sud we founded a group who is now running another blog called Bolletino di Guerra which means "War Reports" because we define domestic violence is a kind of war happening at people‘s homes. There exists a lot of sexist blogs that spread the idea that domestic violence doesn‘t exist and that domestic violence is a feminist myth. Therefore, we also publish letters from women, sons and daughters who write about their stories and how they suffer daily from violence at home. Furthermore we write about questions concerning the gay-lesbian-trans-intersex-queer movements and how they also suffer from violence. We analyse the content of newspapers and television programmes to show the different kind of sexism and racism that is daily spread by mainstream media. We publish information about how people can protect themselves against violent attacks and how they can use the web as a tool to spread their experiences. Generally speaking, Femminismo a Sud publishes all kinds of information which you can hardly find in mainstream media. Our blog is open to external contributions. We publish a lot of emancipatory political ideas and personal experiences from writers who are not part of our group and we have an open mailing-list where we invite people to contribute. We use free software and all the content is published under a creative common licence because our aim is that people share our content. For us, it‘s very important to create free information. Hence, we don‘t allow that people use our content for commercial usage. Do you co-operate with other political groups? Yes, we are connected with a lot of feminist collectives, antifascist collectives and queer groups. We try to support these groups because they are under attack and the political pressure of neoliberal governments is rising every day. We are also connected with other websites and blogs that report on sexist and racist attacks. We exchange ideas with other groups about feminist culture and we set up a virtual library, a long list of links to feminist and anti-racist groups, feminist activism, feminist and anti-racist theory, art and culture. Who are the readers of your blog? We have daily between 1,000 and 1,700 readers, many of them are involved in the feminist movement or in other social movements. A lot of non-Italian people who live in Italy read our blog because they find information about their legal and social situation in Italy and a lot of Italian people who don’t live in Italy read our blog because they find information about what happens in the country.